In their latest study, researchers at the Salk Institute for Biological Studies describe how, depending on the nature of the stimulus, resident macrophages lined up along the blood-brain barrier play opposing roles in the transmission of immune signals into the brain. 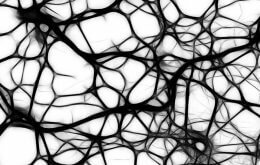 Endothelial cells and macrophages work together to transmit and modulate the strength of inflammatory immune signals to the brain. Image: Courtesy of Jamie Simon, Salk Institute for Biological Studies. “These macrophages act as accelerators to enlist the brain’s participation in dealing with immune insults, but when necessary slam on the brakes to prevent the central inflammatory response from going overboard,” explains postdoctoral researcher Jordi Serrats, Ph.D., who co-led the study with Jennifer C. Schiltz, Ph.D., formerly a postdoctoral researcher in the Salk’s Neuronal Structure and Function Laboratory and now an assistant professor at the Uniformed Services University in Bethesda, Maryland. The Salk researchers’ findings, which are published in the Jan. 14, 2010 edition of the journal Neuron, may pave the way for novel therapies for sufferers of chronic neurodegenerative diseases, such as Amyotrophic Lateral Sclerosis (ALS), Parkinson’s, Alzheimer’s and prion diseases, in which central inflammatory mechanisms play an important role. “The fact that we have identified a potent anti-inflammatory mechanism in the brain presents a new target to intervene in the wide range of central nervous system diseases that possess an inflammatory component,” says the study’s senior author, Paul E. Sawchenko, Ph.D., a professor in the Neuronal Structure and Function Laboratory. In response to an infection, inflammatory cytokines such as interleukin-1 are generated at the site of infection. These cytokines circulate in the blood and communicate with neurons in the brain to engage the hypothalamo-pituitary-adrenal (HPA) axis, an integral part of the brain’s stress response machinery. The HPA axis involves the interaction of the hypothalamus, the pituitary gland, which sits just below the hypothalamus and the adrenal glands at the top of the kidneys. Like a central command center, the hypothalamus sends out corticotropin-releasing factor, which stimulates the pituitary gland to secrete adrenocorticotropic hormone. The latter signals the adrenal glands to ramp up the production of glucocorticoids, which mobilize energy reserves to cope with inflammatory insults. But they also act as very powerful immunosuppressants preventing excessive cytokine production and immune cell proliferation. 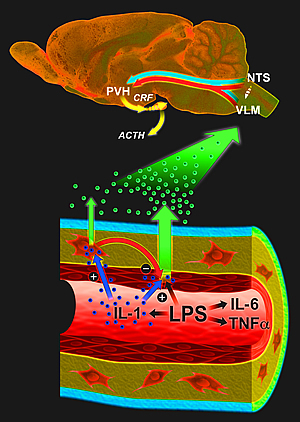 Earlier research by Sawchenko and others suggested a vascular route whereby cytokines interact with vessel walls to generate secondary messengers, which then engage the relevant circuitry in the brain. Tightly packed endothelial cells, which line almost 400 miles of narrow capillaries throughout the brain, are perfectly positioned to record circulating immune signals but they require a very strong signal to become activated. Perivascular macrophages, on the other hand, are more sensitive but don’t have direct access to the bloodstream. To disentangle the exact role of these two cell types, Serrats took advantage of the macrophages’ ability to engulf and ingest solid particles. He injected liposomes containing clodronate, a drug that can cause cell death, into the lateral cerebral ventricle. The liposomes were taken up by the macrophages, which were selectively killed off. Without perivascular macrophages, the animals were unable to respond to blood-borne interleukin-1 and initiate the brain’s so-called acute phase responses, which help the body deal with the challenge at hand but also cause the familiar feeling of “being sick.” But to their surprise, the Salk researchers found that the same cells put a damper on the pro-inflammatory activities of endothelial cells, which form the lining of blood vessels and are only stirred to action—but very powerfully once they are—when they encounter lipopolysaccharide, a key component of the cell wall of certain bacteria. Researchers who also contributed to the study include postdoctoral researchers Borja García-Bueno, Ph.D., and Teresa M. Reyes, Ph.D., at the Salk Institute as well as Nico van Rooijen, Ph.D., a professor at the Vrije Universiteit Medical Center in Amsterdam, The Netherlands. The work was funded in part by the Clayton Medical Research Foundation, the National Institutes of Health, the Spanish Ministry of Education and Science and CIBERsam.